Where Lovina hopes to be over a bug at Thanksgiving! It’s Wednesday morning and we have lots to do today. I think I have some kind of stomach flu. It makes me feel weak so I haven’t moved too far from my recliner yet. Hopefully I will feel better soon. I do not have time to be sick! Tomorrow is Thanksgiving Day and I need to be well for my guests. The school is having their annual Thanksgiving feast today. I won’t be able to make it but maybe the girls can go. Son Kevin, 12, wanted me to come, but I can’t when I’m feeling like this. The Living Skills class always prepares and serves the feast. The menu is turkey, mashed potatoes and gravy, dressing, corn, squash, applesauce, squash bread, and homemade pies. I don’t think this would be possible without the guiding hands of teacher Mr. Ultz. He has worked many years at the school and taught many students how to cook. The school would be lost without him for this class. It would take lots of patience to teach all the students how to cook. He has taught cooking to all eight of our children. The girls or I usually fry the eggs for breakfast but one Saturday morning, my youngest son Kevin told me he would fry our eggs. He said Mr. Ultz taught him how to fry them so I showed Kevin how I fry six to eight eggs at one time on my griddle. Kevin fried up all two dozen eggs for breakfast that morning! He did a very good job. When we have fried potatoes we all like eggs fried over-easy. Son-in-law Mose does not like his eggs over-easy so it is always nice to have someone that will eat the eggs that break in the skillet and turn out well-done. We have not had more than a few snow flurries this season. Yesterday we had rain. 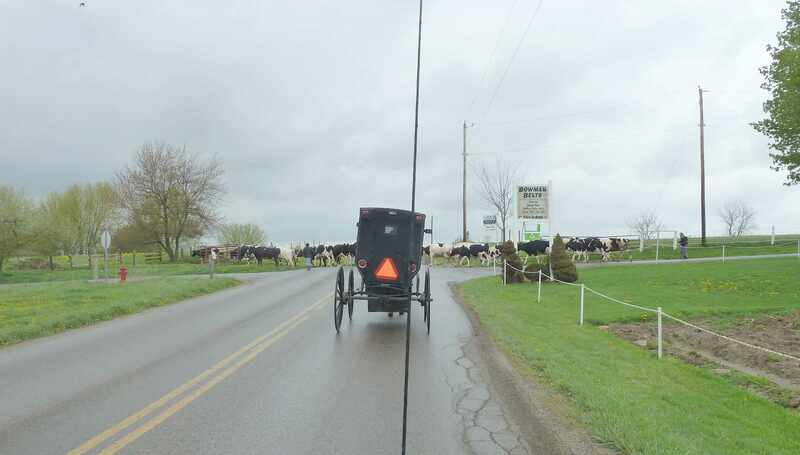 Daughter Susan and I took our buggy and horse Mighty to town to get groceries. It rained on the way home. We have a small trailer that we pull behind the buggy to get groceries. On days when it’s cold and rainy, it makes me glad for our covered buggies. I was raised in a community with open buggies and how well I remember the cold rides. Our buggy has a heater but it’s not hooked up right now. We wait until it gets colder. I wear glasses, so when it rained in the open buggies and if I was driving, my glasses would be hard to see out of. We have hand-operated windshield wipers on our buggy now. Even though the wipers are hand operated (with batteries), it really helps to have them wiping off the outside of the windshield. Plus, I am always glad to have Mighty in town. He’s safe around traffic. Last Saturday my husband Joe, sons Benjamin, Joseph and Kevin, and nephew Henry all assisted Mose and Susan with blowing in insulation in their house walls and attic. Joe and Mose were over there one afternoon after work this week and also put new drywall up in the bedroom. They want to put new drywall in the dining room and living room. They will also take out a wall and add a hallway going to the bathroom from the living room. The insulation and drywall will make the house so much easier to heat. The carpet was pulled out and new floors will be put in after the painting is done. I have two turkeys to get ready today to put in the oven early in the morning. I always like to have the dressing mixed together and the potatoes peeled and in chunks. It makes it so much easier if all of this is done before tomorrow morning. Last night son-in-law Moses shot his first doe this hunting season. That is now the third deer that is getting processed here. Loretta was fortunate enough to get two deer in this first hunting season for her. I’ll close with a delicious recipe for another day! And I wish each of you a blessed Thanksgiving tomorrow. For those of you that have to travel—safe travels to you. God bless you! Mix oil and seasonings. Add chicken and potatoes. Stir to coat and carefully transfer into a greased 9 x 13 inch pan. Bake at 375 degrees for 55-60 minutes, stirring every 20 minutes until cooked through, crisp and browned on outside. Top with cheese, bacon and onions. Return to oven and bake until cheese is melted. 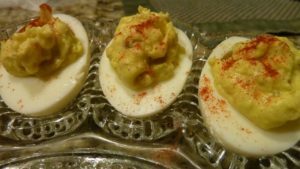 Serve with hot sauce and/or Ranch dressing or sour cream. 7:00 a.m. Lovina and Kevin leave for school with the bus. Joseph bikes to school because he can be home 45 minutes longer. With the chores he does, biking doesn’t make him so rushed. School is only three miles from here so it doesn’t take him long. 9:00 a.m. I start sewing on Susan’s dress, cape, and apron. I had a late start. Had to do some book work first, answer some mail, pay some bills, and now I can feel relaxed to sew. 1:30 p.m. So much for being relaxed. Verena looked out and saw our horses all out in the yard, happily eating grass. We have quite a few horses so they need to be caught and put back inside the fence. 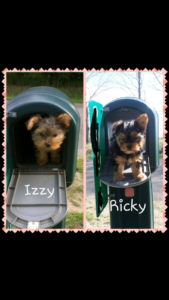 Usually one of them is a troublemaker and takes off running away. I caught our pony Stormy, and two-year-old Beauty that the boys are training to drive. The rest took off. Verena almost caught Tough Boy (Mose and Susan’s pony) but he decided to pull away and join the rest! I knew Verena, Loretta, and I wouldn’t be able to get them all in when they took off down the road and back behind our neighbor’s field. I called the school and asked them to send Joseph home to help. Our neighbor Joe drove his four-wheeler to go herd them back up while Joseph, the girls, and I tried to help chase them in through the gate. What a relief when the last one was inside. We have five horses and two ponies, and Mose and Susan have one horse and one pony. So all together there were nine head of horses. We chained the gate and were trying to figure out how they opened it. Then we saw our miniature pony Prancer go up and take the chain in his mouth and wiggle it back and forth. Joseph tied a rope to secure it better. 3:00 p.m. Lovina and Kevin came home from school on the bus. I am finally finished with daughter Susan’s dress, cape, and apron. She was happy to see it done when she came home from work. 4:00 p.m. Verena and I leave for town as I need some groceries. 6:00 p.m. We are back. Chores are done and the boys are out in the field line-driving Beauty. Beauty will be Benjamin’s horse once she’s trained. She will be his eighteenth birthday gift from us. 7:00 p.m. My sisters Verena and Susan are home from their jobs. They had extra cleaning to do so they worked later than normal. A surprise for Susan’s (Lovina’s sister) birthday. 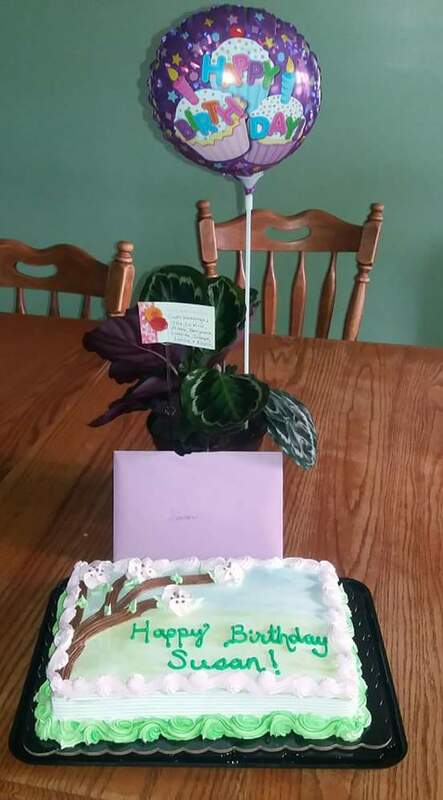 7:30 p.m. We are having pizza, ice cream, and a cake for my sister Susan’s birthday. She was surprised when she came home to see the cake, flower, and balloons we had for her. Loretta’s friend Dustin, Mose, and daughter Susan joined us for supper. 9:30 p.m. Everyone is ready for bed. Dustin, Mose, and Susan left. Now I sit here trying to stay awake and write this column. I feel sorry for the editor that gets to edit the column this week. My writing is showing exactly how tired I am. It’s Thursday again, and my plan to have this column on its way yesterday failed. The weeks still fly by since the wedding is past! Three little pigs? What great ways to get rid of excess garden produce! Our refrigerators are finally getting emptier. With all the wedding leftovers, they were packed. The garden is also getting emptied quickly. The boys pulled the rest of the corn, green beans, zucchini and cucumbers. They brought in red beets and hot peppers that are waiting to be canned, as well as tomatoes that need to be made into juice or something. After a busy summer, I really don’t mind if the garden is done early. Our tomatoes had blight but are doing better. We made the old-fashioned remedy—a mixture of raw milk and water—and sprayed the plants several times. It seemed to help. Our cow Bessie provides us with more than enough milk to use. 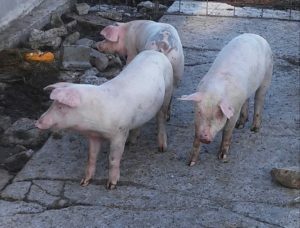 We now have three little piggies that help drink the milk and eat all the excess garden vegetables. 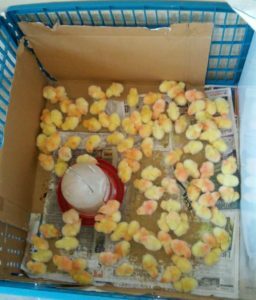 Our new chickens still aren’t laying, but the old chickens provide enough for us yet. I was glad to have sister Emma and Jacob share their eggs for the wedding. Last year for Timothy and Elizabeth’s wedding I didn’t have to buy any eggs, as we had plenty of our own. It takes a lot of eggs to make the noodles, pies, dressing and other food at a wedding. Sunday, August 14, was Timothy and Elizabeth’s first anniversary. We took barbecued chicken in and stayed to eat with them. Mose and Susan were also there. Most couples around this community save the top tier of their wedding cake and put it in the freezer until their first anniversary. But Timothy and Elizabeth didn’t get theirs out yet, as they still had cake from Mose and Susan’s wedding. 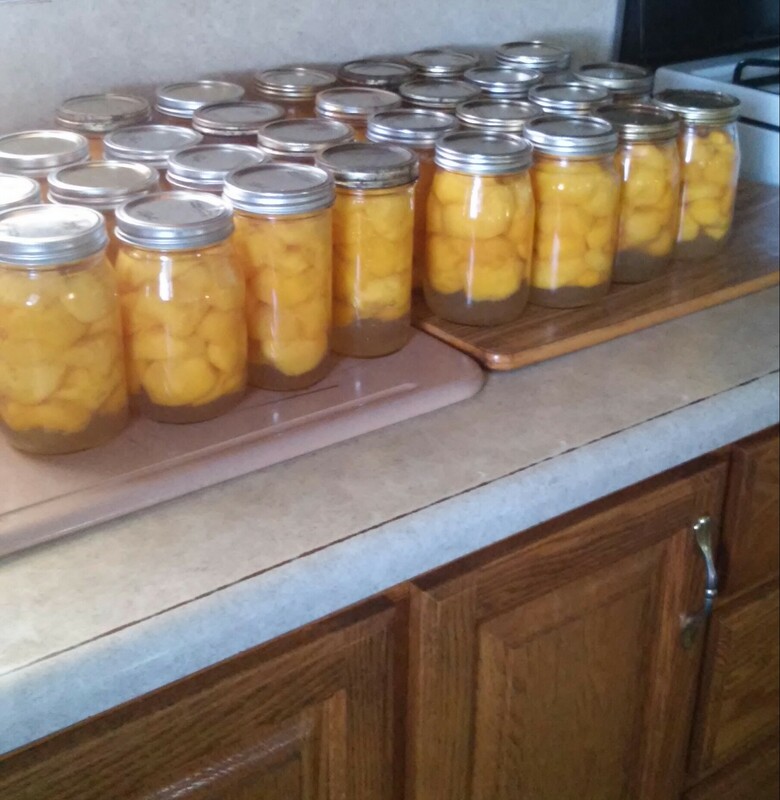 Lovina and her daughters canned two bushels of peaches last week. We canned and froze two bushels of peaches for Mose and Susan and us. 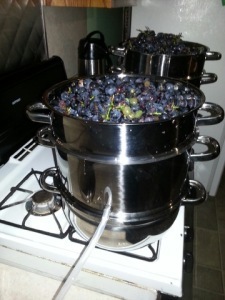 I have another bushel on order. Last week we went to help daughter Elizabeth on Tuesday and Friday. We cleaned her basement and canned tomato juice and salsa for her on Tuesday. Then on Friday we washed off some walls and ceilings and cleaned her whole house. We also washed windows, curtains and bedding. I think she felt refreshed to have everything cleaned. She had been sewing for the wedding and helping here so much that her cleaning was neglected. Today she comes here to spend the day with us. We will probably do some canning. We had a lot of rain on Monday afternoon through Tuesday morning. We had a total of 4.25 inches. The ground was so dry and needed it badly. Half of our huge load of laundry on Monday wasn’t quite dry when the rain started. Hanging outside in all that rain, it was wetter when we brought it in than when we put it out! Yesterday we had a nice day, so we just rewashed it all. So we ended up having an extra big laundry yesterday. We had a very nice day to dry everything. My dad’s cousin Dave from this area passed away, and his funeral was on the same day as Mose and Susan’s wedding. Joe and I took some time the evening before the wedding to go to the viewing and visitation. Our sympathy goes out to his wife, Ruth, and family. Their daughter Sherri was a teacher to several of our children in the recent years. Ruth is a cousin to Joe’s dad, so we saw relatives there from both of our families. Dad’s cousin Leroy from Ohio stopped in at Mose and Susan’s wedding after the funeral to say “Hi” to all my family that was here. I still remember that when I was a little girl, our family would go to visit dad’s uncle Mose and Amanda Coblentz in Hartville, Ohio. Mose and Amanda were Dave and LeRoy’s parents. The part I remember the most was the hills in their yard and the fun of running down them. I will share the green bean recipe we used at the wedding. God bless you all! Cook green beans and onions until tender. Add salt as desired. Drain. Add browned butter to green beans and stir to coat. Continue to heat until the green beans are steaming hot. Add the bacon bits along with salt, pepper and seasoning salt. October also marks another year of penning this column. It is 13 years since I took this over after my mother, Elizabeth Coblentz, so suddenly passed away. She will always be remembered dearly! I enjoy hearing from readers who read her column from the beginning. I was only 19 years old and living at home when she began writing the column. I remember her sitting at the table sometimes to write, after some of us girls were married and had come home to spend the day. Now I can imagine how hard it probably was for her to concentrate, with all of us girls and our young children there talking. She was always so glad to see us come home, and she was always so willing to cook a meal for everyone. I now know the feeling of joy when a married child comes home to visit or to spend the day. Daughter Elizabeth works at the RV factory, so she doesn’t come home as often as I would like her to. She and Susan will have this coming Friday and next week off. I am excited, as it will mean getting more time to spend with Elizabeth. 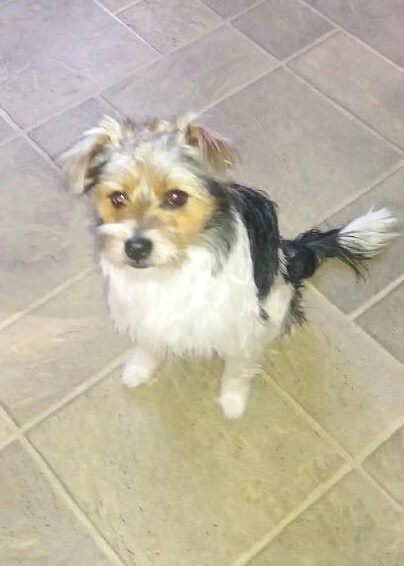 She plans to come home for the day Friday. Our other children are always glad to see Elizabeth and also to see the dogs, Izzy and Crystal, again. I hope that a day next week we can go help her at her house with catching up on whatever she needs to get done. It will be so nice to spend time together. We had communion services in our church district on Sunday. It makes for a long day but always such a refreshing feeling to serve our great Heavenly Father. After the services we stopped in at sister Emma and Jacob’s house to see the progress of the new addition they are building onto their house. It is looking very nice already! Jacob and Emma have lived in a three-bedroom ranch house since they moved to Michigan 11 1/2 years ago. So you can imagine they are excited to be expanding to more space. They are adding a second story with three bedrooms, so that will make room for a bigger kitchen and living room area. They will have five bedrooms after everything is done. My husband, Joe, wanted to start the coal stove on Saturday when the temperature dropped to 30 degrees. Brrr! When he went to check out the stove pipes, he saw that a piece of it had rusted. He went after a piece at a store nearby, but they were out of stock on that size. It was ordered and should be in this week. Now the weather has turned warmer, with the temperature reaching over 70 degrees yesterday. 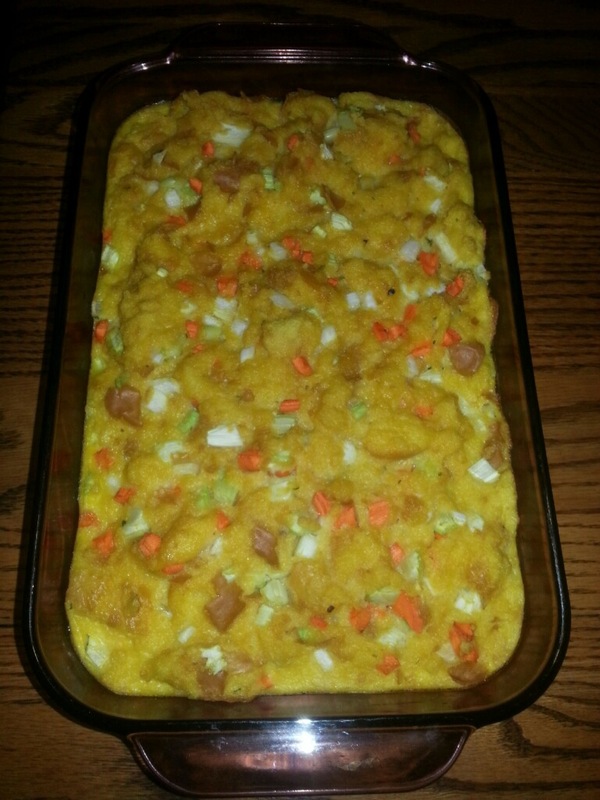 This week’s recipe for dressing, which Lovina prepares for Thanksgiving, is frequently requested by readers. I have had several requests to reprint my dressing recipe. I always use it to stuff my turkey on Thanksgiving. Preheat the oven to 350° F. Grease an 8-cup casserole dish or cake pan. In a large bowl, dissolve the soup base in 2 cups hot water. Add all the remaining ingredients and mix well. Pour into the prepared dish and bake for 40–45 minutes, or stuff inside a turkey before roasting. Another week has passed, and it is time to write another column. 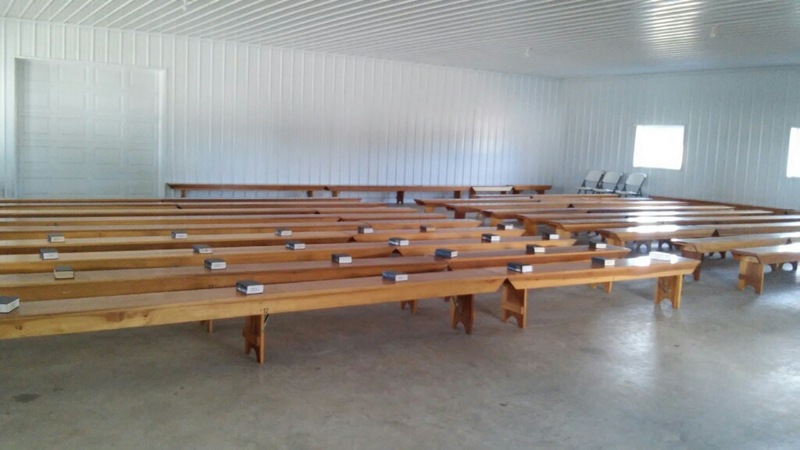 The Eichers set up benches for church services in their new pole barn. 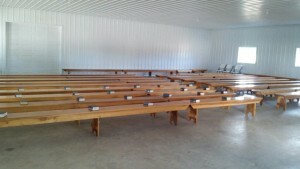 Church services were held here Sunday in our new pole barn. Made a lot more room than when we had it in the basement. Benches were all filled, even though some of our church families were attending baptismal services in another church district. We had quite a few visitors from northern Indiana. Our menu for lunch consisted of homemade wheat and white bread (out of 50 loaves, we had only a few left), smoked sausage links (which we heated up in the oven before serving), cheese spread, peanut butter spread, dill pickles, freezer pickles, red beets, hot peppers, butter, strawberry jam, coffee, iced tea and cookies. We had butterscotch, chocolate chip, sugar and ranger cookies. We served seven tables at one time and four of them were reset, so we had eleven tables to serve altogether. I didn’t have anyone back for the evening meal like we usually do. We were all worn out from having Elizabeth’s wedding here a week before! This week we are busy canning. Yesterday we canned 34 pints of salsa. We still have more tomatoes that need to be canned into something. I would like to make pizza and spaghetti sauce, and I also want to can some salsa for daughter Elizabeth, who just got married. She went back to work and is working ten-hour days. It wears her out to get much done in the evenings. Our cabbage heads are ready to be harvested. We made coleslaw and chili soup for our supper last night. Sons Benjamin, 16, and Joseph, 13, took some garden goodies over to Timothy and Elizabeth. They don’t have a garden, so we want to share with them. We have green beans and hot peppers waiting here to be put into jars. I might freeze the green beans. Also have peaches coming next week. I did take a half-day break and went to neighbor Barbara’s for a Tupperware party one day. It was a Tupperware shower for neighbor Susie, who was married on June 4. They served lunch to us before we left. Sometimes getting away from home for a while boosts your energy. Tomorrow we plan to attend the wedding of Leander and Karen. The wedding will be about six miles from our house. Leander is a son of Joe’s cousin Leander and his wife Rosina. Son Leander recently moved to our community. School doors will open on September 8. Our three youngest are ready for that day. Joseph will be in seventh grade, Lovina in fifth (and in middle school), and Kevin will be in fourth grade (his last year in elementary). The years keep going by way too fast! 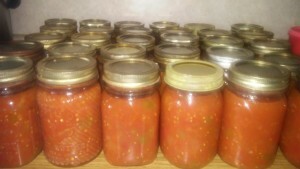 This week Lovina shares a recipe for homemade salsa. 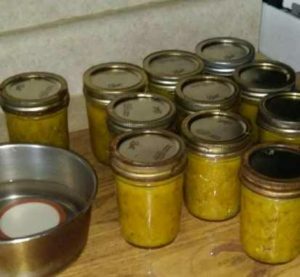 Her recipe makes 15 pints of canned salsa. This week I’ll share my salsa recipe with you readers. 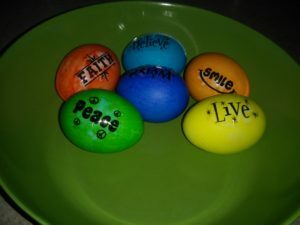 God’s blessings to all! Mix all of the ingredients except Clear Jel in a big pot. After the mixture boils, cook for 45 minutes, stirring occasionally. Then mix Clear Jel with 1–2 cups of water before adding to the rest of the ingredients to thicken. More jalepeño peppers can be added to desired taste, and more Clear Jel can be added for a thicker salsa. Cold pack according to your canner’s instructions. Makes about 15 pints.